Chili peppers or its scientific name, Capsicum, have been a part of the human diet since ancient times. 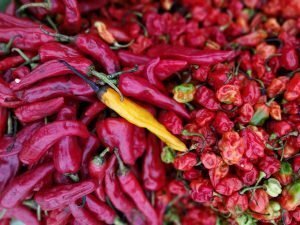 Research suggests that chili peppers may have been one of the first crops cultivated in Mexico and some parts of South America. Christopher Columbus was among the first of European explorers to encounter chili peppers in his travels to the West Indies. Chili peppers have been used for various reasons throughout history. Folklore mentions the chili pepper with the use of its smoke to control misbehaving children. It was also a tale that anyone who refused to eat a chili pepper was immediately suspected of being a wizard. Capsicum annuum: which includes the well-known green and red bell peppers, cayenne and jalapenos. Capsicum frutescens: which includes Tabasco and Thai peppers. Capsicum chinense: which includes the hottest peppers such as habanero and naga. Capsicum pubescens: which includes the South American rocoto peppers. Capsicum baccatum: which includes the South American aji peppers. Peppers are commonly broken down into three categories: bell peppers, sweet peppers and hot peppers. When a pepper is consumed, Capsaicin from the pepper binds with the pain receptors the mouth, which then relays a signal to the brain that there is heat and discomfort in the mouth. The intensity of the “heat” of the chili pepper is commonly measured in Scoville heat units. The Guinness Book of World Records stated in 2016 that the hottest chili in the world was the Carolina Reaper at 2,200,000 Scoville heat units! The Carolina Reaper is from the Capsicum chinense family. Chili peppers can be used fresh, dried, pickled, roasted, ground into powders and used in ointments, tinctures or teas. It is also the primary component in pepper spray. Medicinally, Capsaicin, the active ingredient in chili peppers, can be used to treat a variety of ailments. It can be used in many cold and flu remedies, as well as to treat sinus congestion. It can be used topically to relieve pain such as diabetic neuropathy or headaches. Capsicum have been used to help fight inflammation in the body including arthritis. Capsicum may treat gastrointestinal disorders such as diarrhea, microbial overgrowth and parasites. It can also provide relief of PMS, menopausal symptoms, depression and fibromyalgia. Capsicum can help fight cardiovascular disease, improve blood sugar, and aid in immunity, skin care and weight loss. Current research is examining Capsicum in its ability to fight cancer as well. Chili peppers contain both vitamins and minerals that are extremely beneficial to health. It always best to check with your health care provider before starting any treatment. As winter’s chill sets in and the temperature falls one way to keep warm may be to eat some peppers!